Select your retailer for more info or buy. After being given tickets for a three-month voyage around the Pacific on the container ship Konstellation by her grandmother, Jana elects to take her friend, Kelsie McNeil with her. On board they meet the other passengers, artist Rowan Clardy and an elderly couple, Hank and Denise Thorpe. After an ordinary trip through the Panama Canal, the Konstellation is attacked by pirates who strip the ship of all its communication and electronic equipment. The five passengers manage to hide in an empty container and escape being caught. They later discover they are alone on the ship. After a frightening time when they disarm bombs placed by the terrorists the five realise they have no way to control the ship. The engine is still going but all communications and navigation gear is destroyed. At this point, Jana and Rowan begin a romance that lasts throughout the novel. Days later, the Konstellation hits a coral reef and begins to sink. The five passengers manage to land on a coral atoll where their adventures really begin. N.B Thankyou to the hundreds of readers who downloaded our books during July’s free month. 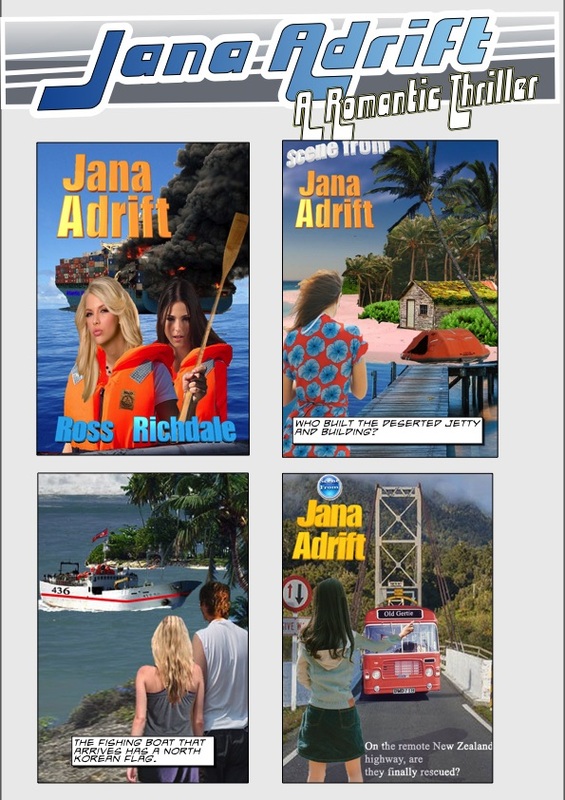 Remember that our usual price is only $US 2.99 including Jana Adrift that was not on last month’s free list.